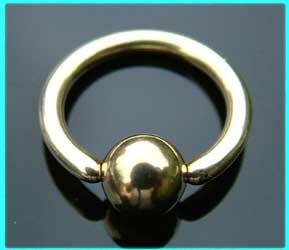 BCRs, ball closure rings for a variety of body piercings. 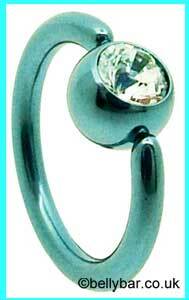 These body jewellery rings & belly rings can be used in most curved body piercings. Bcrs and Belly rings for most body piercings, these are surgical steel body jewellery or titanium body jewellery,as stated. Ball closure rings have clip in balls so to wear them you need to get used to how to open and close the jewellery. It is best to practise a few times until to get used to how they work if you want to fit your own body jewellery. These 1.2mm surgical steel ball closure rings are available in a 1.2mm x 6mm, 1.2mm x 8mm, 1.2 x 10mm, 1.2mm x 11mm, 1.2mm x 12mm or 1.2mm x 13mm size. These 1.6mm surgical steel ball closure rings are available in a 1.6mm x 7mm, 1.6mm x 8mm, 1.6mm x 10mm, 1.6mm x 12mm, 1.6mm x 14mm or 1.6mm x 16mm size. These 316L surgical steel horseshoes are available in a 1.2mm x 10mm or 1.6mm x 12mm size. These barbells are available in a 1.2mm x 10mm or 1.6mm x 12mm size. These 316L surgical steel barbells are available in a 1.2mm x 10mm or 1.6mm x 12mm size. Titanium body jewellery, 1.6mm ball closure ring with a haematite ball. 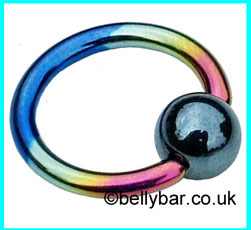 Rainbow titanium ball closure ring with haematite ball. which is available in a 1.6mm x 8mm, 1.6 x 10mm, 1.6mm x 12mm, 1.6mm x 14mm size. The size is the internal diameter of the ring. This si a 1.2mm x 8mm solid pink titanium bcr with a clip in ball. The size refers to the inside diameter of the ball closure ring. This solid, pink titanium ball closure ring is available in a 1.6mm x 10mm or 1.6mm x 12mm size. The size refers to the internal diameter of the bcr. This is a 1.2mm x 8mm petrol blue titanium bcr with a clip in ball. 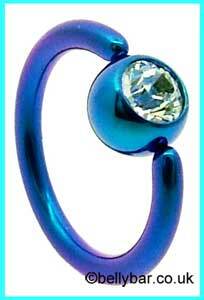 This petrol blue titanium ball closure ring is available in a 1.6mm x 10mm or 1.6mm x 12mm size. Titanium bcr with matching clip in ball, usually used in tragus, labret & eyebrow piercings, and also as bellyrings, can be used in most 1.6mm curved body piercings. 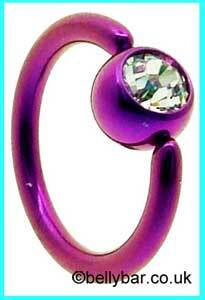 Solid purple titanium ball closure ring which is available in a 1.6mm x 10mm or 1.6mm x 12mm size. The size refers to the inside diameter of the bcr. This is a 1.2mm x 8mm ice blue titanium bcr with a clip in ball. Titanium bcr with matching ball. 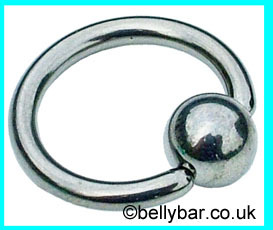 Usually used as bellyrings and can be used in most curved 1.6mm body piercings. High polish, solid titanium ball closure ring which is available in a 1.6mm x 10mm, 1.6mm x 12mm or a 1.6mm x 14mm size. Titanium bcr, ice blue colour, with matching titanium clip in ball, usually used in eyebrow, labret & tragus piercings, as well as bellyrings, these can be used in most curved 1.6mm body piercings. Solid ice blue titanium ball closure ring & matching titanium clip in ball, which is available in a 1.6mm x 10mm or 1.6mm x 12mm size. 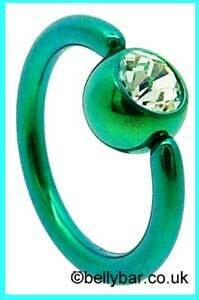 This solid, green titanium ball closre ring is available in a 1.6mm x 10mm or 1.6mm x 12mm size. This yellow titanium bcr is available in a 1.2mm x 8mm or 1.2mm x 10mm size. The size refers to the internal diameter of the ball closure ring. Titanium bcr, with matching clip in ball, usually used in eyebrow, tragus & labret pierings, and also for belly button piercings. 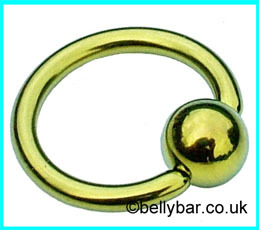 Solid yellow titanium ball closure ring with matching titanium clip in ball, which is available in a 1.6mm x 8mm, 1.6mm x 10mm or 1.6mm x 12mm size. This is a 1.2mm x 8mm dark blue titanium bcr with a clip in ball. Blue titanium bcr with matching clip in ball, usually used in eyebrow, labret & tragus piercings, also as belly button rings, and can be used in most 1.6mm curved body piercings. 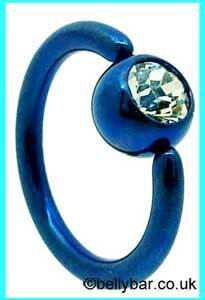 Dark blue titanium ball closure ring which is available in a 1.6mm x 10mm or 1.6mm x 12mm size. PVD gold titanium ball closure ring with jewelled clip in ball, titanium body jewellery suitable for belly button piercings etc. 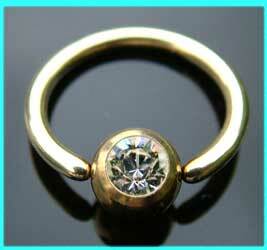 Solid titanium PVD gold bcr with clear jewelled clip in ball, the best pvd gold body jewellery we have found. 1.6mm x 12mm. PVD gold titanium bcr, 1.2mm thick. Titanium PVD gold ball closure ring, these pvd gold bcrs are the best quality we can find, they look just like solid gold, and are made to last. Sizes available are 1.2mm x 7mm or 1.2mm x 8mm with 4mm clip in ball. PVD Gold titanium ball closure rings, 1.6mm thick. Gold PVD bcrs, these are the best quality we can find, and are made to last, they look the same as gold. Sizes available are 1.6mm x 8mm, 1.6mm x 10mm, 1.6mm x 12mm, all with matching PVD gold titanium clip in balls. The price is for 1 as shown, please choose the size you would like. This two tone titanium bcr has a clear jewelled clip-in ball and is available in a 1.6mm x 10mm or 1.6mm x 12mm size. This purple titanium bcr has a clear jewelled clip in ball and is available in a 1.6mm x 10mm or 1.6mm x 12mm size. This petrol blue titanium bcr jas a clear jewelled clip-in ball and is available in a 1.6mm x 10mm or 1.6mm x 12mm size. This ice blue titanium bcr has a clear jewelled clip-in ball and is available in a 1.6mm x 10mm or 1.6mm x 12mm size. This green titanium bcr has a clear jewelled clip-in ball and is available in a 1.6mm x 10mm or 1.6mm x 12mm size. This dark blue titanium bcr has a clear jewelled clip-in ball and is available in a 1.6mm x 10mm or 1.6mm x 12mm size. 1.6mm x 10mm surgical steel bcr with a 4mm clear jewelled ball. 1.6mm x 10mm surgical steel bcr with a 4mm light pink jewelled ball. 1.6 x 10mm surgical steel bcr with a 4mm cerise jewelled ball. 1.6 x 10mm surgical steel bcr with a 4mm aqua blue jewelled ball. 1.6mm x 10mm surgical steel bcr with a 4mm AB jewelled ball. 1.6mm x 10mm surgical steel bcr with a 4mm light blue jewelled ball. 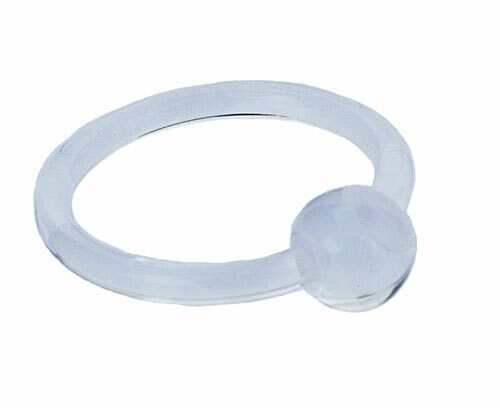 This 1.6mm x 12mm clear acrylic belly ring has a 5mm clip in ball. 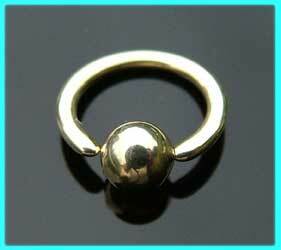 This 1.6mm x 12mm ball closure ring has a 5mm clip in ball. 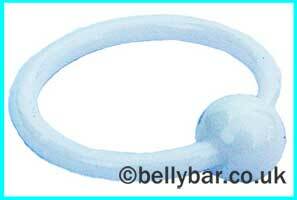 This 1.6mm x 12mm blue acrylic belly ring has a 5mm clip in ball. This 1.6mm x 12mm purple acrylic belly ring has a 5mm acrylic clip in ball. This black acrylic, 1.6mm x 12mm BCR has a 5mm black acrylic clip in ball. 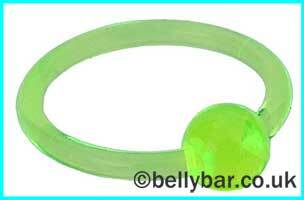 This 1.6mm x 12mm lime acrylic bcr has a 5mm clip in ball. This 1.6mm x 12mm red acrylic BCR has a 5mm clip in ball. 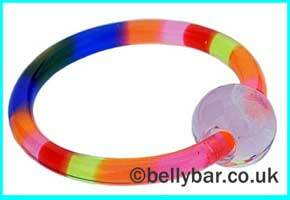 This 1.6mm x 12mm rainbow acrylic belly ring has a 5mm acrylic clip in ball. These 1.6mm x 12mm surgical steel bcrs have marble design acrylic clip in balls that glow under UV light , please choose the colour you would like.